The 300 women, who are the first batch of the 1000 women targeted for the initiative, were provided with Trade Assets including coolers, tables, umbrellas and Coca-Cola beverage products, after completing their training modules on financial literacy and business skills. Speaking at the handing over ceremony held in Alausa, Executive Secretary of LSETF, Mr. Akintunde Oyebode, stated that the empowerment initiative was in line with the vision of the Lagos state government to create jobs, wealth opportunities and alleviate poverty among residents in the state. Oyebode, while commending the beneficiaries for their tenacity and determination to improve their lots economically, urged them to judiciously put into use all the skills acquired as well as the resources mobilized for them. He expressed appreciation to the partners for complementing government’s effort in the empowerment of women, saying such collaborations would ultimately help to reduce social problems and address the alarming rate of unemployment in Lagos State. He also called on other private sector partners to join LSETF to create jobs in the State. Managing Director of Coca-Cola Nigeria Limited, Mr. Bhupendra Suri, represented by Public Affairs & Communications Manager, Nwamaka Onyemelukwe, advised the women to make the best use of the resources handed over to them by effectively deploying the skills and assets in the running of their businesses profitably and sustainably. 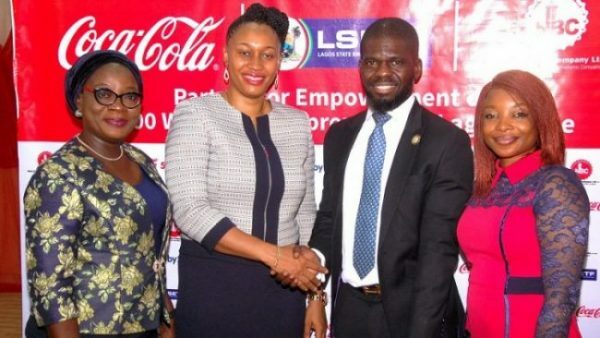 She also reaffirmed the commitment of Coca-Cola Nigeria to empowering Nigerian women through its numerous initiatives, emphasising that the company recognises the socio-economic value that women bring to enterprise development and urged other corporate organisations to consider Women Empowerment as a business imperative. “We are as prosperous as the communities in which we operate. The shared prosperity we envision as a company would only add up when we commit resolutely to empowering people living around the communities where we operate. We believe any investment on them, particularly women, would trigger not only economic growth but foster sustainable development. As you are aware, women are pillars of the communities we serve and pillars of our business. We are convinced that they will play a significant role in shaping Nigeria’s economy over the next decade. So, empowering the women through this initiative would go a long way to addressing poverty and unemployment in the state,” She said. In his own remarks, Public Affairs and Communication Director, Nigeria Bottling Company (NBC) Limited, Ekuma Eze, restated the commitment of the company to women empowerment, saying that it would continue to support efforts that enhance shared economic growth. One of the beneficiaries, Mrs. Lolade Akingbade, who expressed gratitude to all the partners for their support and donation at the handing over ceremony, promised to grow her business to become a big enterprise. “We have been equipped with necessary skills over the last two months and we would deploy these skills into use in running our businesses,” Akingbade added.